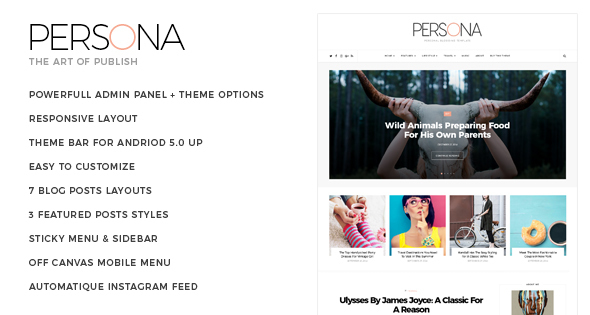 Description: Persona - Life Style & Personal Blogger Templates is an Elegant Life Style & Personal Blogger Template for Bloggers, Clean, Pure and Unique design to start your personal blog, it comes with many New Features, Easy to Customize, Custom Theme Options, Fully Customizable, Fast Loading and Outstanding Support. Switch Between Layouts Using Blog Settings Only. New! Mega Menu Posts Feeds. New! 4 Sorted Posts Feeds By : Recent / Random / Discussed / Category. New! Fast Loading Theme (Lazy Loading Images). 3 Featured Posts Styles (Boxed, FullWidth, Centred). Theme & Post Layouts (Fullwidth, Left Sidebar, Right Sidebar). Page Templates : Tags, Categories, Archive, Search Results. Useful Shortcodes : Buttons, Tooltip.